Do you want to reach more people on Google+? 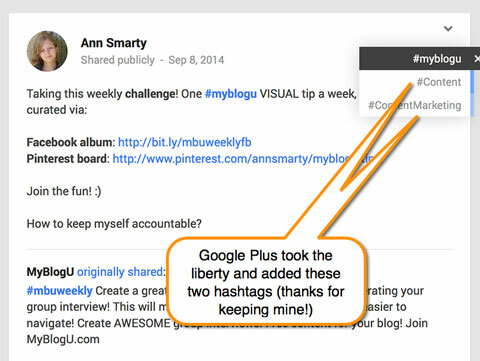 Are you using Google+ hashtags? Google+ hashtags make it easier for people to discover your content, even if they’re outside your circles. That added visibility gives you greater overall reach. In this article you’ll discover how to find hashtags to reach the right people on Google+. 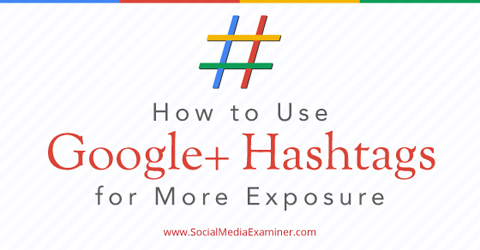 Find out how to use hashtags on Google+ to increase exposure for your business. When Google+ started supporting hashtags, the news was met with some skepticism. People wondered if Google+ was blindly following Twitter and Facebook–and whether Google+ hashtags would be as useless as Facebook hashtags. The answer turned out to be no on both counts. Google+ hashtags are actually an efficient way to bring more exposure and visibility to your Google+ profile and brand, but they work a bit differently than you’re used to. Other social networks use hashtags to curate content by filtering updates that include a specific hashtag. If you search for #easyrecipes, your results only show updates that include that hashtag. There’s no way to search only for the hashtag you typed in. 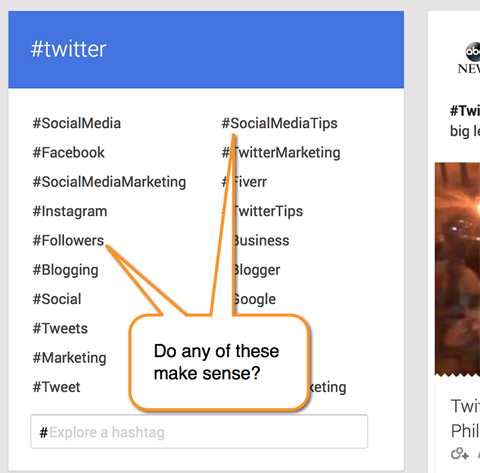 It’s the additional related results that set Google+ hashtags apart. It’s handy to know the topical relevance of several updates, as well as the connections between topics and objects. The only downside is that you don’t have any control over the relevance of the search results. Google+ uses a complex algorithm to identify which updates make it into your home stream—even if those updates are from people who are not in your circles. This algorithm appears to include hashtag relevance. I’m seeing much more interaction from people outside of my network when I include a couple of hashtags in my Google+ updates. For example, sometimes my updates show up as “hot” for users known to have related interests. Google+ uses an algorithm to serve content to people based on related interests. And in the example below, a user is showing up in my stream even though I’m not connected to him. However, we have several things in common—including the hashtags we use or follow—so Google+ served the update to me. We have quite a few things in common, but I have found hashtags to be always in the mix! You can take advantage of shared interests by searching for a hashtag and making note of the results. Find out what related topics people are talking about and which related hashtags they’re using, then use both in your future updates. You’ll have a better chance of appealing to a wider audience and you’ll be more likely to show up in their feeds. While other social media networks rely on users to tag their own updates, Google+ is taking the liberty of doing it for you, which may not be such a bad thing. Google+ added two hashtags to mine, but still displays mine on top. For example, if you used a not-so-popular hashtag or included just one hashtag, Google+ will automatically add more hashtags—and that gives you additional reach. You can easily turn off the Google+ auto-tag feature in your settings. 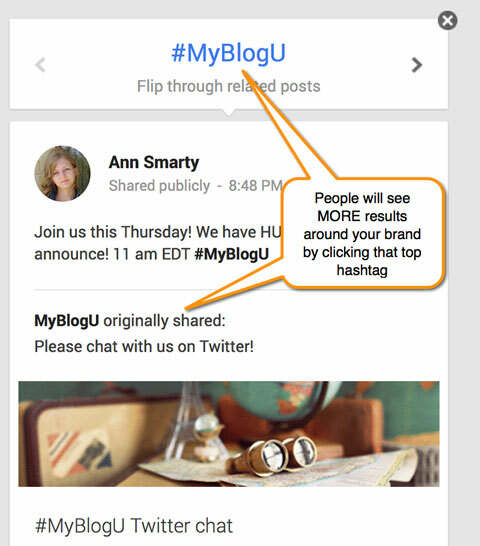 If you’re not crazy about Google+ adding hashtags and would rather use your own, you can do that. Disable Google+’s automatic hashtag feature by going into your settings and unchecking the box. Now that you’re on your own for hashtags, the question is how to come up with the most relevant ones, right? One option is to use the Explore section and sift though related hashtags—kind of like a mini keyword search. As I mentioned, when you search for a hashtag on Google+, your results include a separate box with the most popular and recently used hashtags. You can look through those and pick the ones that are most likely to expand your reach. Make it a habit to search the Explore section to find relevant popular hashtags. You can also use the Google+ auto-suggest function. Just start typing anything after # and you’ll see some additional suggested hashtags. Don’t forget to use #yourbrandname in your Google+ updates. 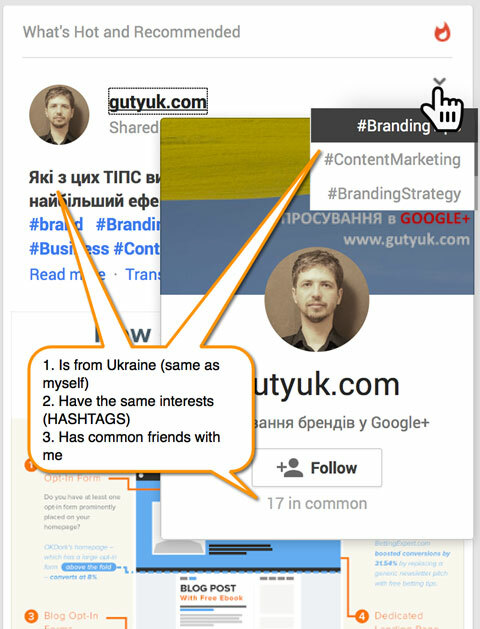 If you have enough users hashtagging your brand name in the relevant context, those updates are very likely to be suggested to additional users as “related” whenever they’re exploring Google+. In most cases, Google+ shows hashtags in the upper right corner in the same order as they appear in your update, so be sure to use your branded hashtag first! When readers click on it, they’ll see more updates around your brand via the Flip Through box. A branded hashtag brings up even more content related to your business. Quick tip: If you’re hosting a Twitter chat, consider cross-promoting your hashtag on Google+ for more awareness and brand visibility—it works really well. Finally, make your hashtags useful. On Twitter, people often use hashtags as a fun way to express extra emotion or jokes. That kind of hashtagging doesn’t make much sense when you’re trying to extend reach. If you want your hashtagged updates to work, make it easy for Google+ to categorize them. Use hashtags that match your content, not your emotions. Hashtags should make perfect sense, add to the topic and even provide context. If you follow those guidelines, your updates are more likely to be seen by a larger audience. Google+ hashtags are an important tactic for reaching a wider audience. Of course, choosing the right hashtag can make or break this social tactic, so take the time to tag your own updates rather than relying on Google+ to do it for you. Use the Explore section to find the hottest related hashtags and learn more about your niche and how to best target it on Google+. Just don’t get too carried away. Over-tagging is spammy—especially when the hashtag isn’t directly related to your topic.